Hell in A Cell 2018 Recap « Believe-In-Rollins.com | Your Most Dedicated Source for Seth Rollins! The future is now; therefore, we believe...in Seth Freakin Rollins. Welcome to the innovative architect of the fan site world. As the most dedicated source for the new gold standard in the WWE, we will provide all the latest news, photos , interviews and more! We look forward to seeing the career of Seth Rollins rise with all of you! Have you met Seth Rollins, gone to a wrestling event or an appearance and taken great photos? Do you have fan art/graphics to share? Or a video? If so then I’d love post them on the site! Go to our contact page (by clicking the image or on our menu bar) & attach your photos, videos, or tweet them to me! Don’t forget to let me know what name to credit you by (either your first name, twitter name etc)! This website is not affiliated with either Colby "Seth Rollins" Lopez, or any organization(s) in which Colby has been affiliated with. This is a fan site, owned and operated by a fan. It is strictly for entertainment purposes only and does not profit from any of the content featured. Images and related content are copyrighted to their respective owners and are being used under Fair Use Copyright Law 107. No copyright infringement is intended. If you have an issue with any content featured on this website please do not hesitate to contact the admins first before taking any other action. We would be happy to work with and assist you. It’s not every day that The Shield walk into a fight and don’t come out the winner, so it says a lot about Dolph Ziggler & Drew McIntyre that they held off two of The Hounds of Justice — Dean Ambrose & Seth Rollins — to retain the Raw Tag Team Championship … even if they resorted to some rule-breaking when things truly got dire. Ambrose & Rollins came into the match looking to prove themselves as workhorses, and while they certainly worked hard, the champions worked smart, staying juuust on the right side of the rulebook while employing a timely array of distractions and interference to stop the challengers from reaching full steam. When Ambrose chopped McIntyre down to his knees, Ziggler jumped the ropes to start a commotion that helped the Scotsman escape. When Rollins had Ziggler lined up for a suicide dive, McIntyre tripped him up in the ropes, and The Showoff pounced with a DDT. As the match began to go long, strategy seemed to go out the window, with Ambrose throwing hands at anything that moved (he had eyes for McIntyre in particular) and Rollins answering Ziggler’s counters with counters of his own in an athletic showcase. Eventually, the champions managed to work their way back to their initial game plan, though they were far less subtle this time around as McIntyre blatantly rushed the ring and struck in the middle of a Rollins sequence, obliterating The Kingslayer with the Claymore while he was hoisting Ziggler up for the Falcon Arrow. 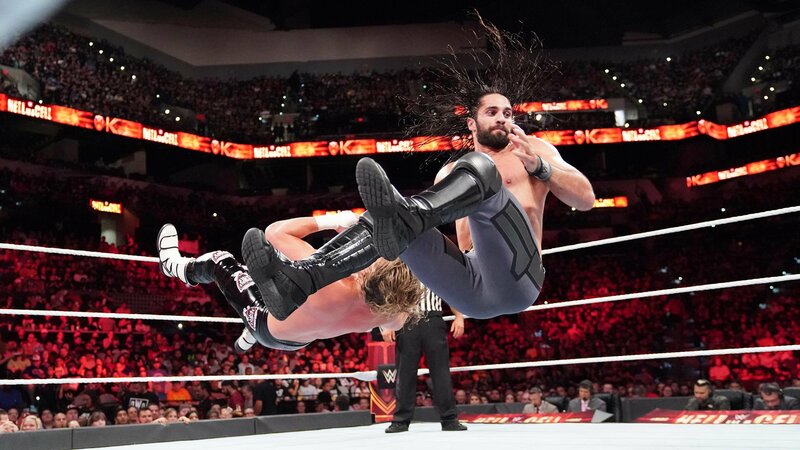 The Showoff fell on top of the KO’d Rollins to earn the three-count, ending a bout that may well have remade the Tag Team division as Corey Graves said — yes, it was that good. But even if the game has changed, the titles stay where they are. According to Braun Strowman, all Mick Foley had to do as the Special Guest Referee was count the pinfall on Universal Champion Roman Reigns. As it turned out, the conclusion to the main event of WWE Hell in a Cell wasn’t so simple, as the arrival of several Superstars, including Brock Lesnar, brought the bout to an unprecedented ending: A no contest. Except, maybe they could. When Dolph Ziggler & Drew McIntyre — Strowman’s “Dogs of War” — attempted to force their way into the Cell, Dean Ambrose & Seth Rollins ran interference and initiated a mad scramble around and atop the Hell in a Cell. All four Superstars threw fists and swung kendo sticks with reckless abandon atop the harrowing structure, and the brawl ended with McIntyre and Ambrose laid out atop the cage, while Rollins and Ziggler tumbled off the side through the commentary table. Then, Brock Lesnar’s music hit, and what had been a figurative hell turned literal very fast. The Beast Incarnate, who lost the Universal Title to Reigns at SummerSlam (and had been denied the rematch he wanted at WWE Hell in a Cell), kicked open the door and attacked both champion and challenger, reducing a chunk of a table to splinters across their backs before laying both out with F-5s — Reigns landing on top of Strowman. Paul Heyman, meanwhile, incapacitated Foley with what looked like pepper spray to the face, leaving the replacement ref no choice but to call off the match. So Strowman’s cash-in fails. Reigns’ big defense ends in ruins. And Brock Lesnar is ready and willing to unleash hell on anyone who’s anywhere near the Universal Championship.